It is about as easy as it gets. The documentation covers pretty much everything Contact Form 7 can do and includes many pointers for more advanced uses, integration with plugins such as Akismet (for spam filtering), Google Analytics, reCAPTCHA, and more. reCAPTCHA needs no introduction; most of us have had to solve one or two, at one point or another. You need a Google account and you will have to register your site, to obtain an API key pair. You will then have to configure the obtained keys in “Contact > Integration > reCAPTCHA”; once done, you can add the reCAPTCHA form tag into your form. I personally dislike reCAPTCHAs. I find them time-wasting and annoying and, honestly, I think of them as poor user experience. The legitimate user should not have to prove that they are not a bot – instead the bot should have to prove that they are, actually, human. The “Quiz” option offered, has a similar logic, that the user has to prove that he’s not a bot. Personally, I’d prefer this over a reCAPTCHA, for the reason that if your questions are really simple, the human user will be able to answer them in a matter of seconds. Here is how it works: you type pairs of questions – answers, separated by a |. If you type more than one questions (one per line), one is going to be randomly selected each time. 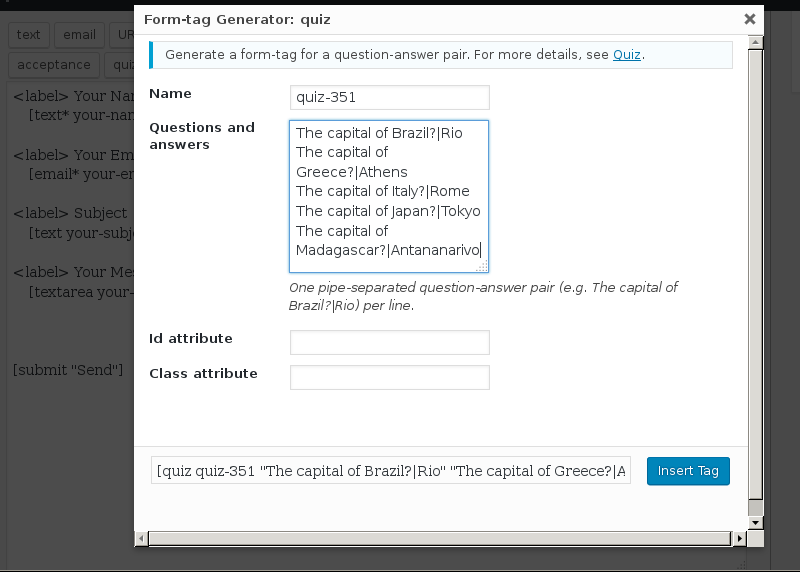 The first Q-A pair (“The capital of Brazil?|Rio”)is actually given as an example on the CF7 quiz generator. So, if you use this question, and your frustrated users cannot reach you, cause they keep typing the actual capital of Brazil, Brasília, please do not blame this article. Contact Form 7 offers an out-of-the-box integration with Akismet. You can find a detailed guide on how to add Akismet spam protection in your form in Contact Form 7 documentation. 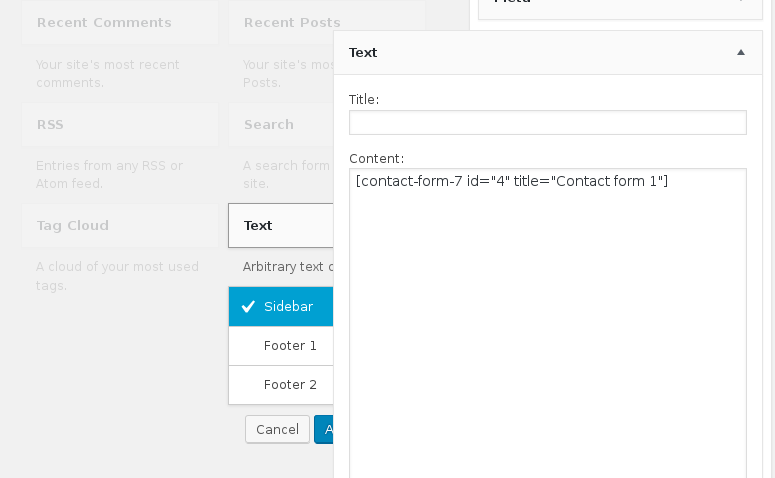 By appending the shortcodes with Akismet options (ex. [email* your-email akismet:author_email]), all user data is compared to the Akismet databases and spam submission will fail. Takayuki Miyoshi, the developer of Contact Form 7, has also created a simple CAPTCHA plugin, Really Simple CAPTCHA. It creates a random 4 characters code that the user has to input in a textbox. 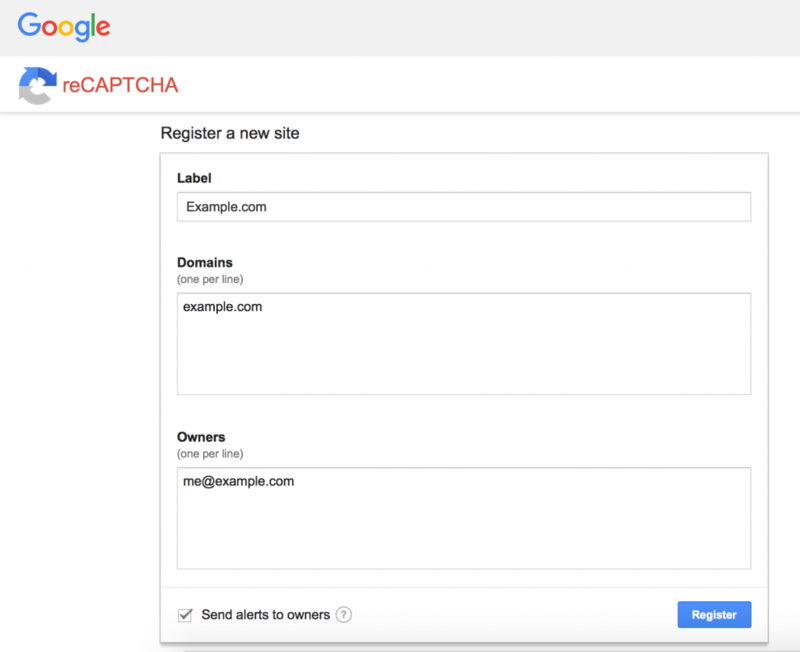 Compared to Google’s reCAPTCHA, it is simplistic and not as secure; however, simple might just be what you need for a small site with a very simple contact form. The bot will fill the additional text area, which will then flag the form submission as spam. If we scroll down, past the list of premium features and the example shortcodes, we will find a section called: “PopUp Display Rules”. Here you can choose a number of scenarios to display the popup. For the sake of brevity, let’s create a rule that makes the popup show only if page is equal to Contact Page. Right below this section the display options are located. The most important options here are the “Trigger action” and the “Conversion cookie” time. Trigger action is by default set to 5 seconds after page load – we want to change this to “Manual Triggering”, as the popup should only appear once the user has successfully submitted the form. The “Conversion cookie” displays a numerical value in seconds which represents how long before the popup reappears to the user. I strongly suggest, for all your popups, to input a high value – nothing chases users faster away from your website, than popups constantly appearing. In your code you will have to substitute the number 6 with the number that comes after the #spu- part of the ID. This can be done very easily, using the Popup Maker plugin. Popup Maker is pretty robust, with many options, including themes. Let’s ignore all this options for now, and go to the “Add New Popup” screen. On the right part of the page, you can choose where you want your contact to display. I chose here “Contact” page. What will trigger your cookie to be created? where we can choose “On Popup Open”, and then, we are presented with a screen that allows us to set our cookie. 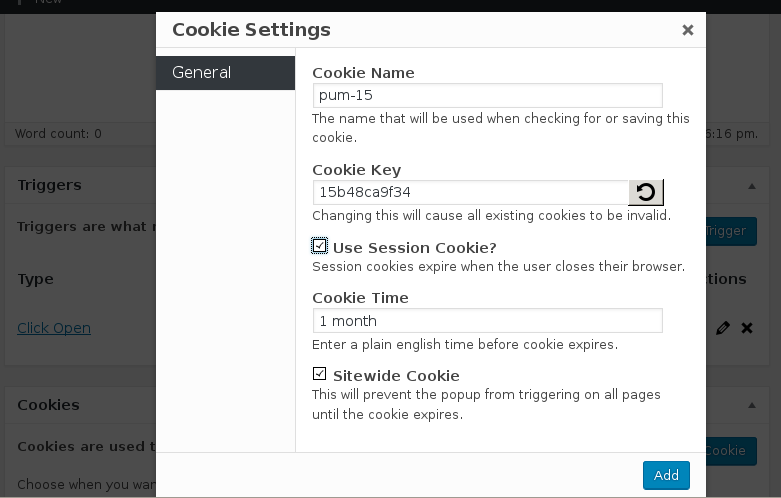 To create a cookie key, simply click on the “Refresh” button next to the Cookie key text area. I checked the “Use Session Cookie” option, so that the cookie will expire once the user closes their browser; however this is not particularly important. The above popup how-to’s both focused on a very basic use. However, using the same principles, you could extend the functionality of your contact form. Example uses include, give a download link to the user, once they have successfully filled the contact form, add a MailChimp sign up shortcode to anyone who contacts you, and more. Several premium plugins support multi-step forms. While using a multi-step form doesn’t make sense if you just want the user to fill in their name and email and send you a message, in the case of a long, complex form, it is a good idea to break the form in multiple screens. 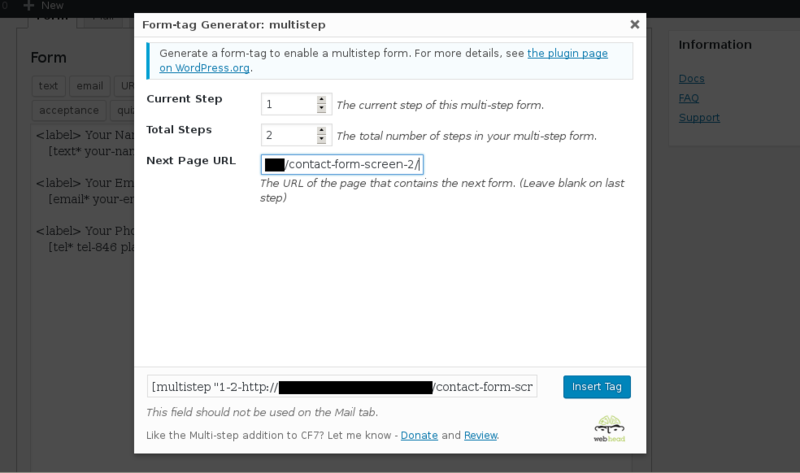 CF7 does not offer this option, however another free plugin, called Contact Form 7 Multi-Step Forms does, as you might have guessed, exactly this. The first thing you have to do once you install this plugin is to plan your form. How many screens will you need? For each screen, create a new page or post and note down the URL – you will need it when you are creating your screens. 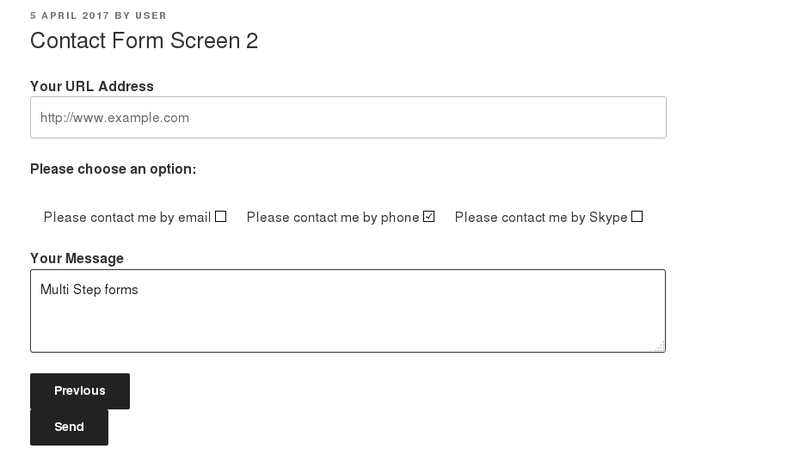 For this example, we will create two posts for a two-screen form. 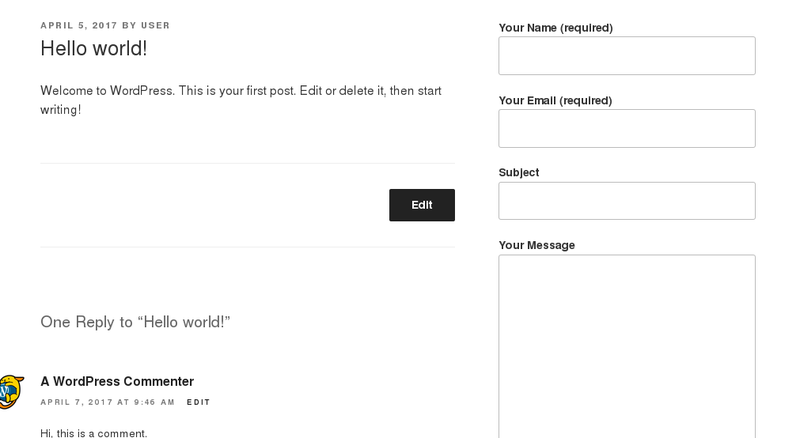 The posts in this example are named “Contact Form Screen 1” and “Contact Form Screen 2”. 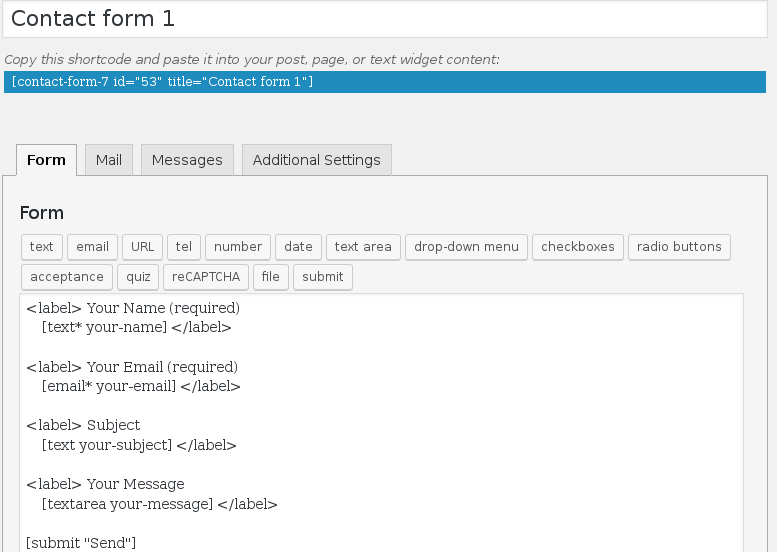 Let’s save the form and immediately paste the generated shortcode in the text editor of the “Contact Form Screen 1” post. Now we will repeat the exact same process with the second form; however this time, as it is our last screen, we will leave the “Next Page URL” empty. One of the main characteristics of CF7 is that it emails you all form data. User submitted information is not stored anywhere. If your mail server malfunctions, you are in danger of losing form entries. However, this is something that can be easily taken care of. There are a number of free plugins that work seamlessly with CF7 and give exactly this capability: to store form data in the database. Takayuki Miyoshi, the developer of CF7, created an additional plugin that takes submitted form data and saves them in the database. The add-on is called Flamingo. The use of Flamingo is pretty straight-forward (and the idea behind it is something that I, personally, appreciate very much: modularity, programs that do one thing and do it well). 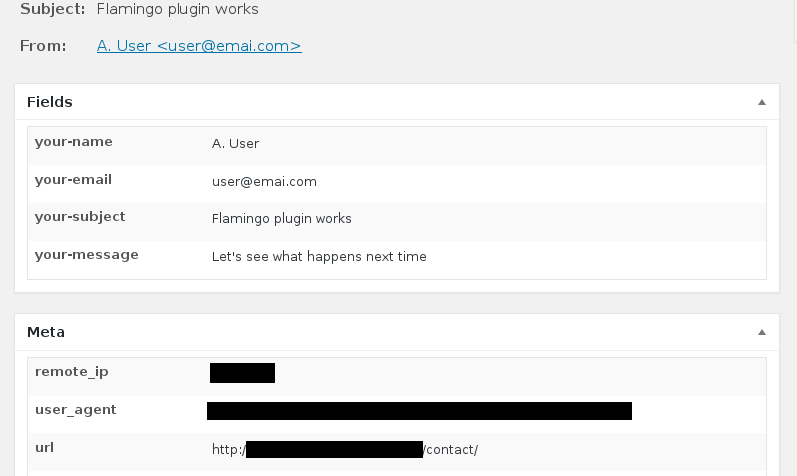 Flamingo, together with CF7, give a more complete solution, that allows your users to contact you through your contact form, and you to receive their messages in both your email, as well as your WordPress dashboard – also with the opportunity to export all form data to Excel or CSV. Flamingo works out of the box and does not disappoint. It creates an address book from, not only the emails of those who contacted you via CF7, but also of those who used the comments section to reach you. If you click on any of the “History” links in your address book, you will get detailed information of the sender – by further clicking the “Subject” of the message, you can see all sort of additional information, such as the IP of the user, the user agent string, the URL address from which they reached you, and more. 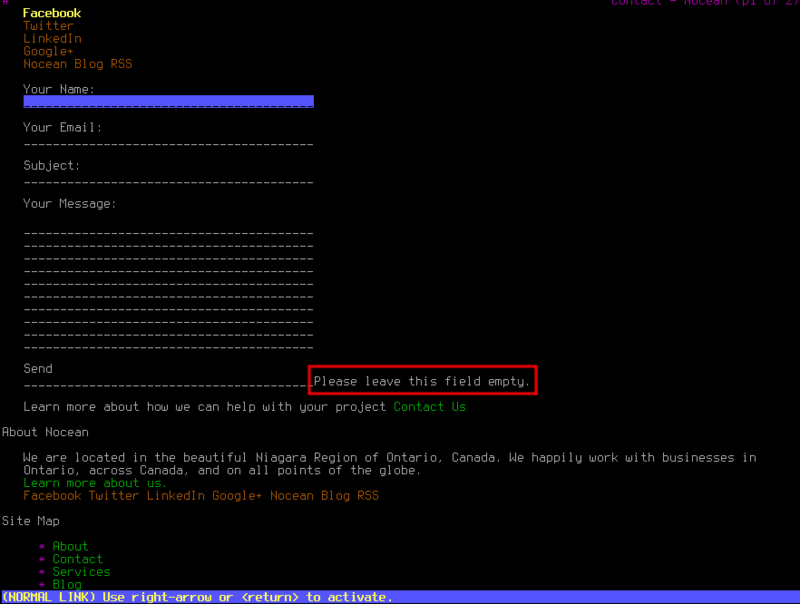 CFDB (Contact Form Database) is a plugin that got, a couple months ago, pulled off the WordPress plugin directory. The short story is that, there was a security concern in the plugin. The plugin got de-listed and the developer got contacted. The developer, Michael Simpson, fixed the vulnerability within 24h, however the plugin never got re-added. It appears to be a case of bureaucracy within the WordPress community. However, to the credit of the developer, he released again the plugin, free and open source in GitHub and he continues the development and keeps it up-to-date. 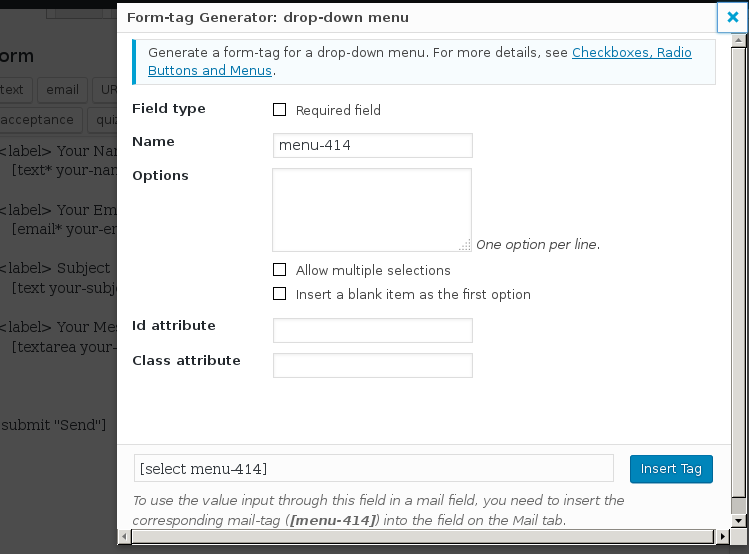 Despite the name, this plugin actually retrieves data from a variety of form submissions, including JetPack Contact Form plugin, Gravity Forms plugin, Ninja Forms plugin and more. It offers a variety of shortcodes that enable you to show and hide columns, to only display data on users with a minimum role, to sort, search and filter columns, and much more. Here is the full list of shortcodes and their uses. With this article, we tried to cover some functions that users often require from a contact form plugin. We hope that we demonstrated that CF7, much like WordPress itself, is modular and extensible and, with the right tools, you can materialize most uses scenarios you might have in mind. Thank you for reading. We provide WordPress & WooCommerce Support, Maintenance and Development Services.